Battery Park and the north entrance of the Hugh L. Carey (Brooklyn Battery) Tunnel from the World Trade Center. Photo taken in May 1999. 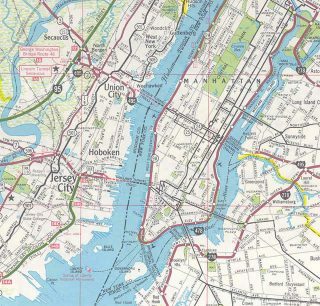 This map inset from the 1969 New Jersey Official Map shows the previous proposed route of Interstate 478 over the Manhattan Bridge rather than the Brooklyn Battery Tunnel. 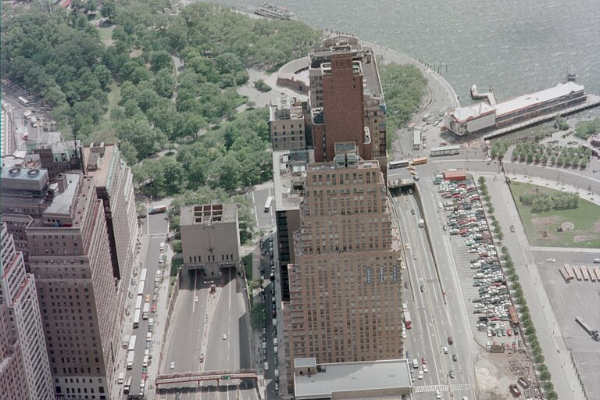 This was part of the planned Lower Manhattan Expressway, which would have taken I-78 across Manhattan from the Holland Tunnel east to the Williamsburg Bridge with I-478 branching south via the Manhattan Bridge. 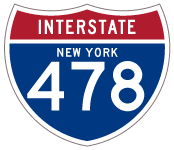 Interstate 478 originally extended north as far as Mid-town Manhattan along the former elevated West Side Highway. The West Side Highway closed on December 16, 1973 from the Battery north to West 46th Street due to structural deficiencies and a collapse of a 60 foot section at Gansevoort Street. The remainder closed afterwards to West 57th Street, with a temporary roadway built along West Street and 12th Avenue. Demolition of the elevated West Side Highway took place between 1977 and 1989.2 The route was dropped as an Interstate highway per AASHTO on November 8, 1986. Leaving the Hugh L. Carey (Brooklyn Batteru) Tunnel, I-478 splits with a turn off for Trinity Place and curves west to New York 9A (West Street). Photo taken by Dan Moraseski (Winter 2001). I-478 intersects NY 9A (West Street) beyond the Battery Parking Garage. 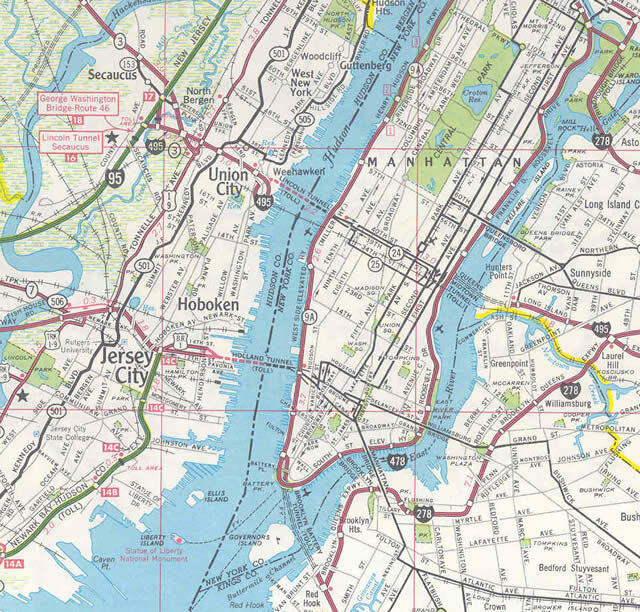 NY 9A runs along the Hudson River two miles to the Holland Tunnel (I-78) and five miles to the Lincoln Tunnel (MSR 495). Photo taken 05/99. Heading south on New York 9A, a two lane ramp (Exit 2) lowers into a short tunnel ahead of the Hugh L. Carey (Brooklyn Battery) Tunnel entrance below Battery Park. Photo taken 08/09/04. Unsigned I-478 descends from NY 9A (West Street) into the Hugh L. Carey (Brooklyn Battery) Tunnel. Photo taken 08/09/04. Traffic south through the Hugh L. Carey Tunnel emerges from below the East River just ahead of I-278 (Brooklyn Queens Expressway) at Red Hook in Brooklyn. Photo taken 08/09/04. Continuing past the site of the former toll plaza, I-478 partitions into ramps for Interstate 278 (BQE) west the Belt Parkway and Staten Island, Hamilton Avenue to Red Hook and the BQE east to Atlantic Avenue and Astoria in Queens. Photo taken 08/09/04. The ramp for I-278 east from the Hugh L. Carey Tunnel south passes below the BQE through a tunnel and combines with an on-ramp from Hamilton Avenue. Photo taken 08/09/04. Interstate 278 (BQE) east approaches the left exit for I-478 (Hugh L. Carey Tunnel) north to Manhattan. Photo taken 06/13/05. A lane drop occurs at Exit 25 for Hugh L. Carey (Brooklyn Battery) Tunnel, resulting in a bottleneck for eastbound traffic on the BQE. Photo taken 06/13/05. Exit 25 departs I-278 (BQE) east for the tolled Hugh L. Carey Tunnel (unsigned I-478) north to Lower Manhattan. Photo taken 06/13/05. The BQE shifts northward and elevates over I-478 and parallel Hamilton Avenue before traveling below grade through Brooklyn’s Cobble Hill community. Photo taken 06/13/05. Interstate 478 lowers 0.4 miles from the separation with I-278 (BQE) to the entrance for the Hugh L. Carey (Brooklyn Battery) Tunnel. Photo taken by Cesar Centano (08/22/08). “Cashless Tolls In Place At Hugh L. Carey Tunnel.” WLNY CBS New York, January 4, 2017. West Side (Joe DiMaggio) Highway, NYCRoads.com. “Brooklyn-Battery Tunnel Renamed After Late Gov. Hugh Carey.” CBS New York, October 22, 2012. Hugh L. Carey Tunnel (formerly Brooklyn-Battery Tunnel).